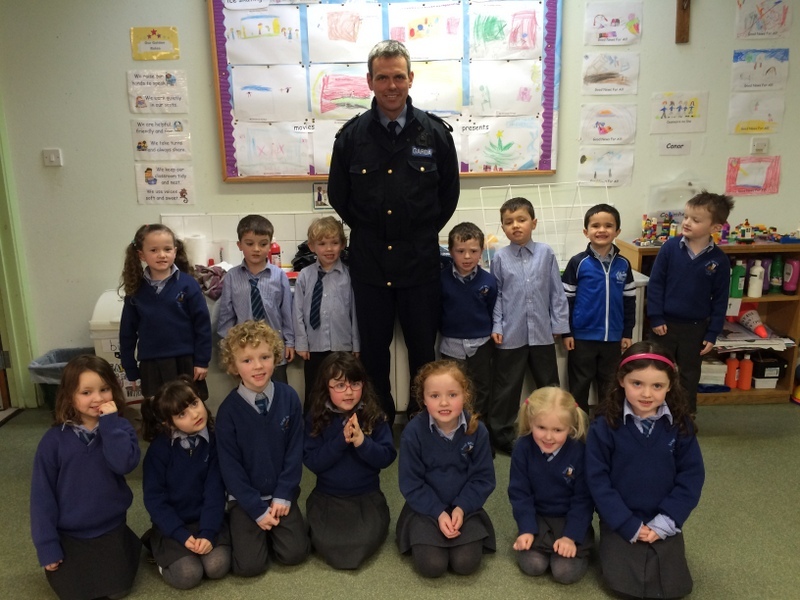 In late January, we had a visit from Garda Jonathan O’ Donovan of Schull Garda Station who told us lots of interesting information about his work in the community. 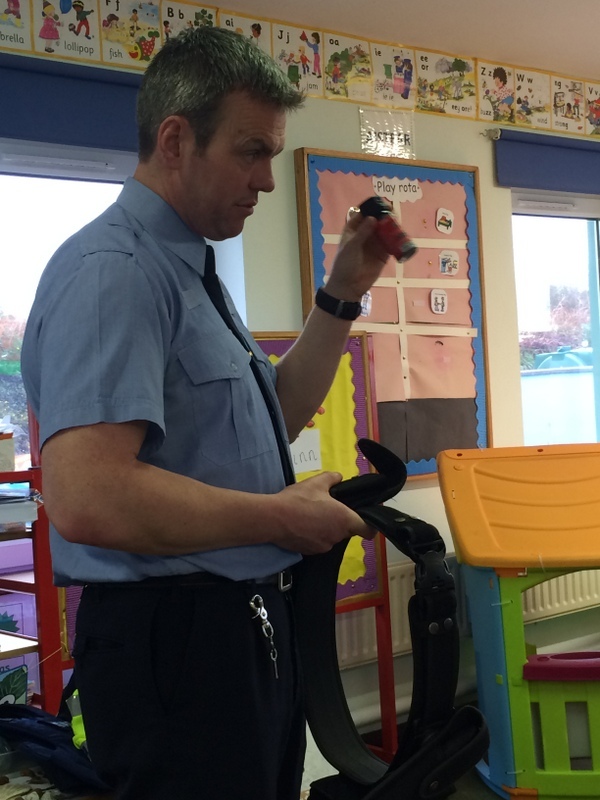 He showed us some of the equipment on his utility belt, including his walkie talkie, handcuffs, a retractable baton and pepper spray. 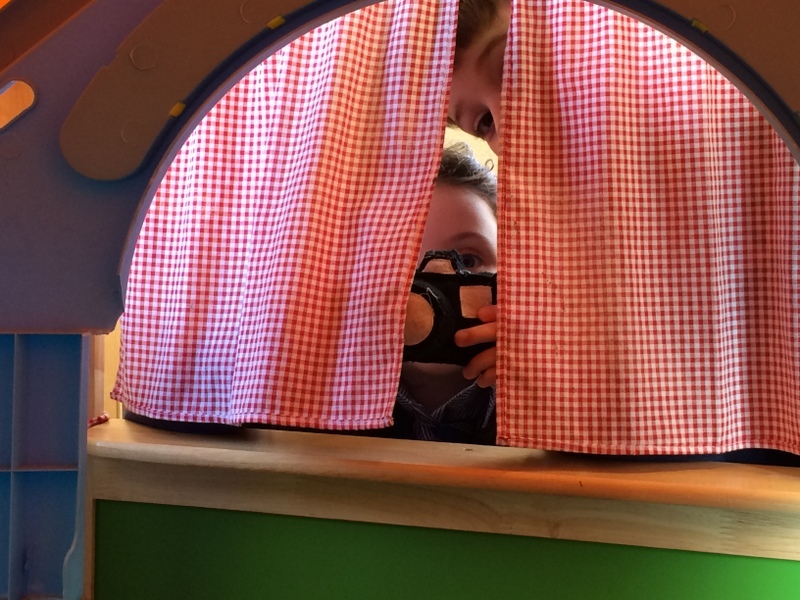 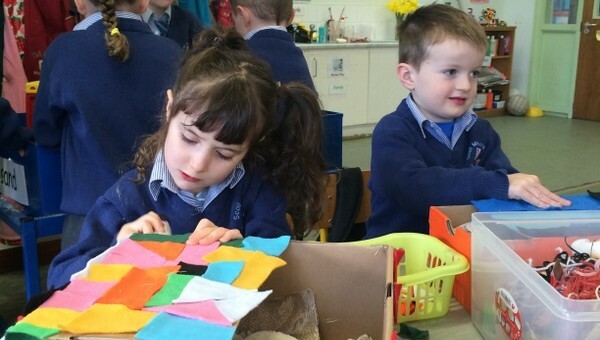 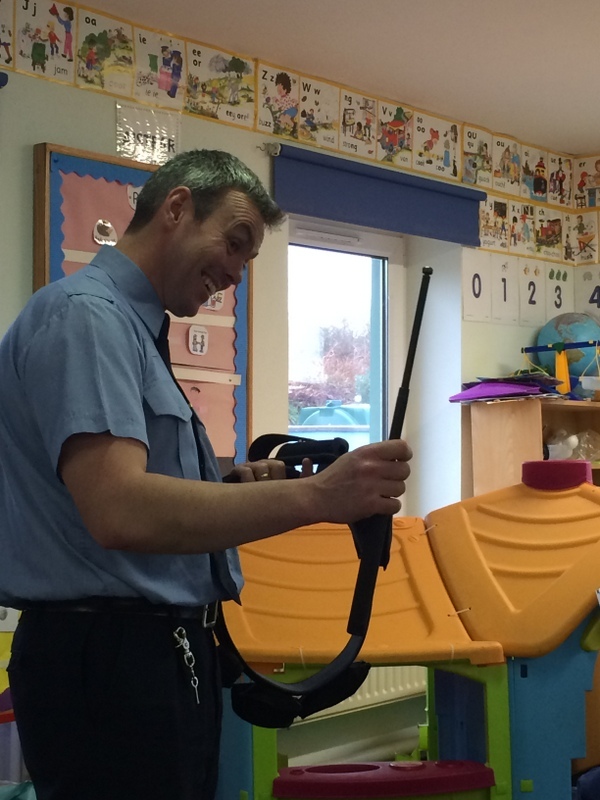 He demonstrated how to make a call on his walkie talkie, as he called Bantry Garda Station from the classroom. 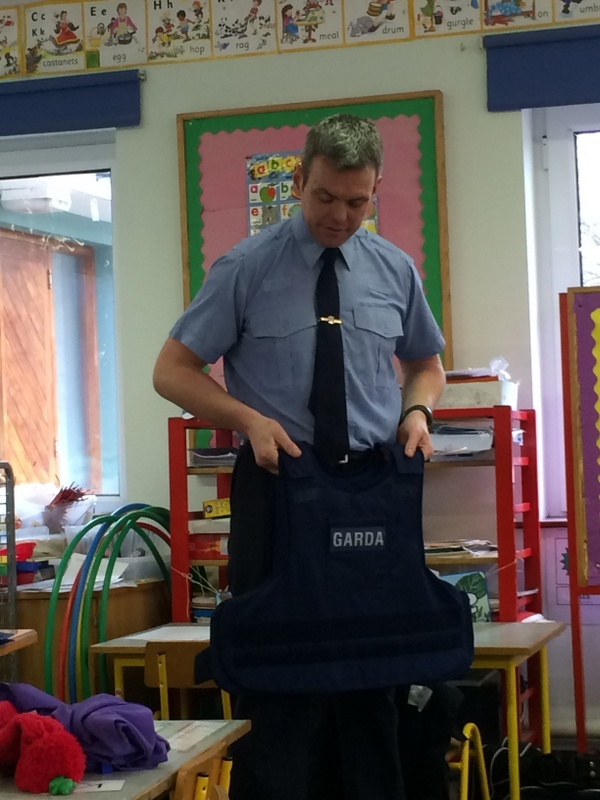 Garda O’Donovan explained that the letters CW on his lapel are short for Cork West and then the number that follows is his personal Garda number. 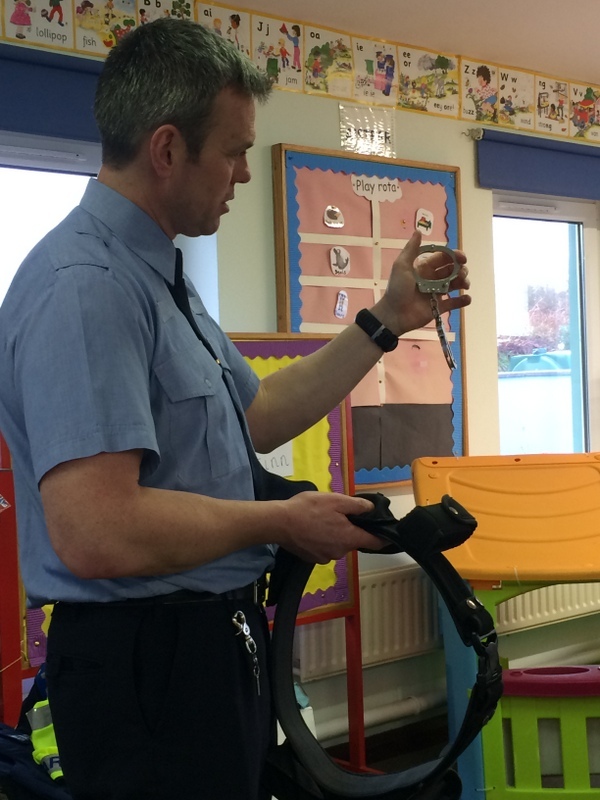 He spoke to us about road safety and stressed how important it is for children our age to sit in a car seat in the back of the car. 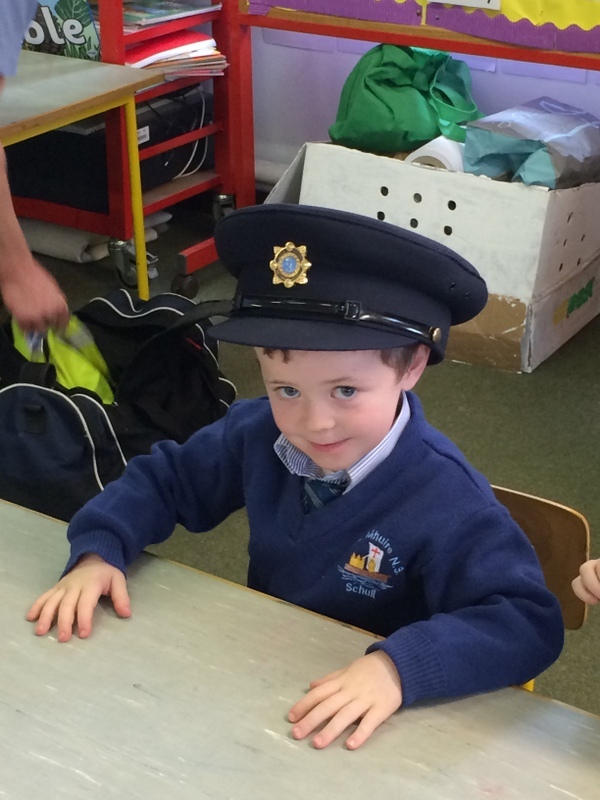 Garda O’Donovan also showed us the squad car and turned on the siren for us! 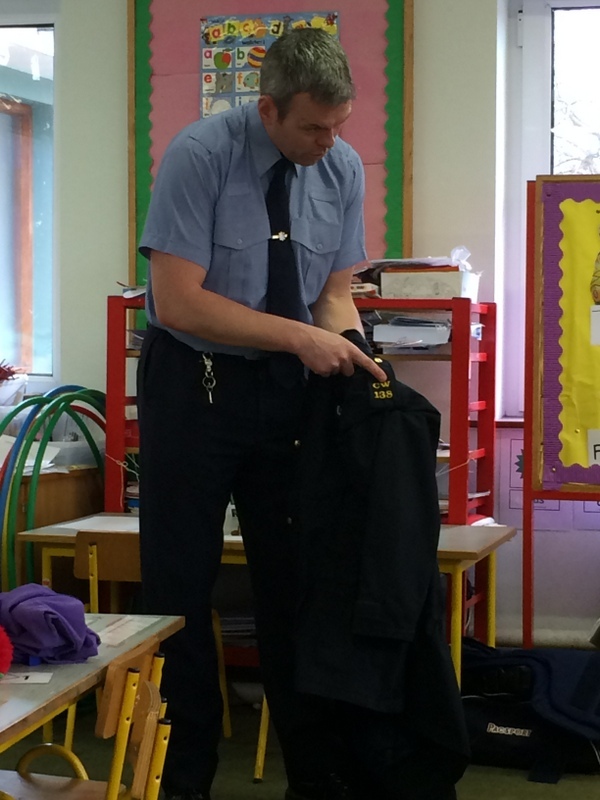 We were very grateful to him for taking the time to visit our classroom and speak to us. 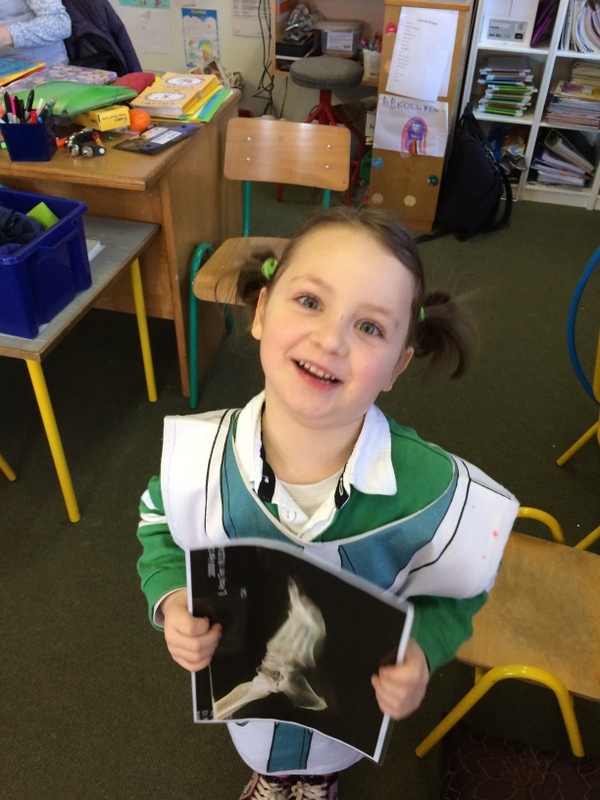 Míle Buíochas Garda O’Donovan! 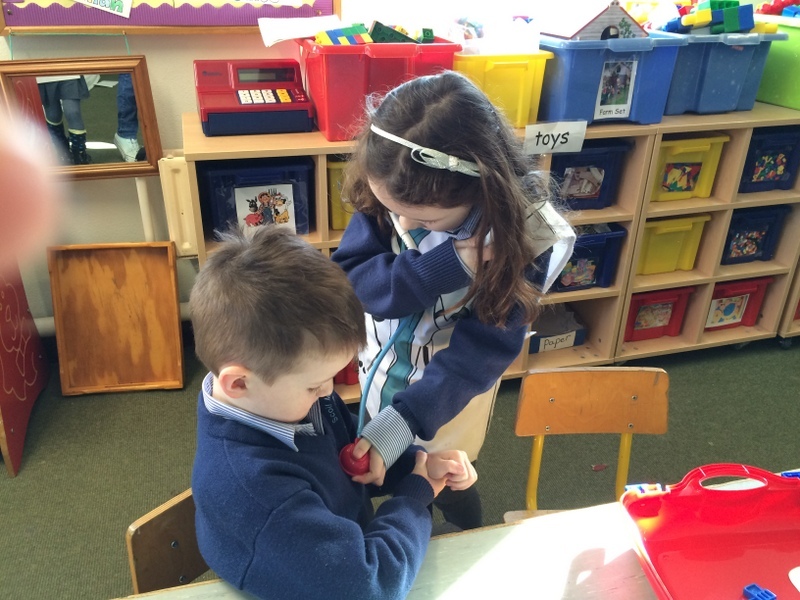 The CW on the lapel stood for Cork West. 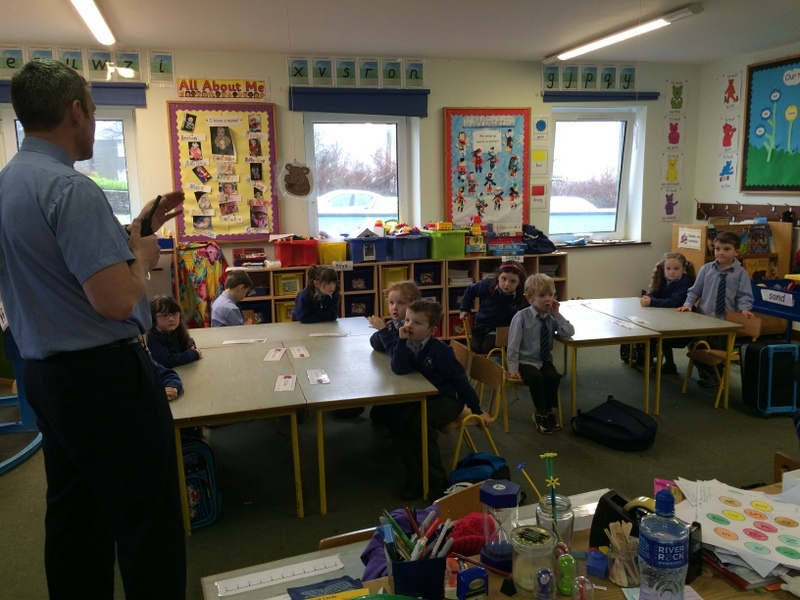 Garda O’Donovan advised us on how to stay safe in a car. 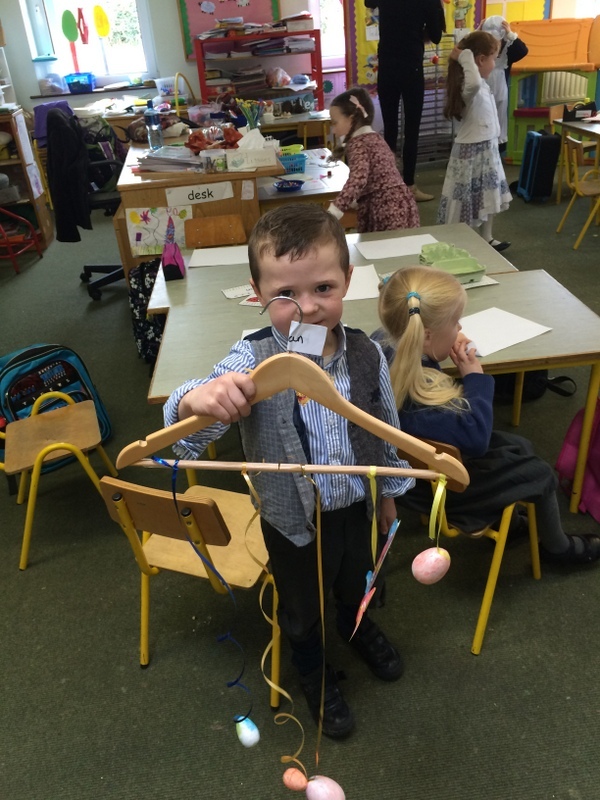 Handcuffs from the Garda’s utility belt. 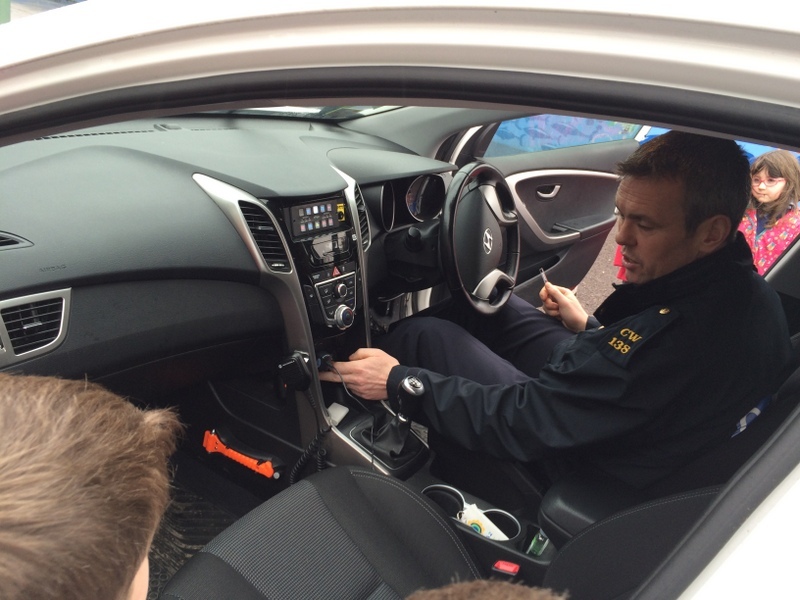 The inside of the squad car. 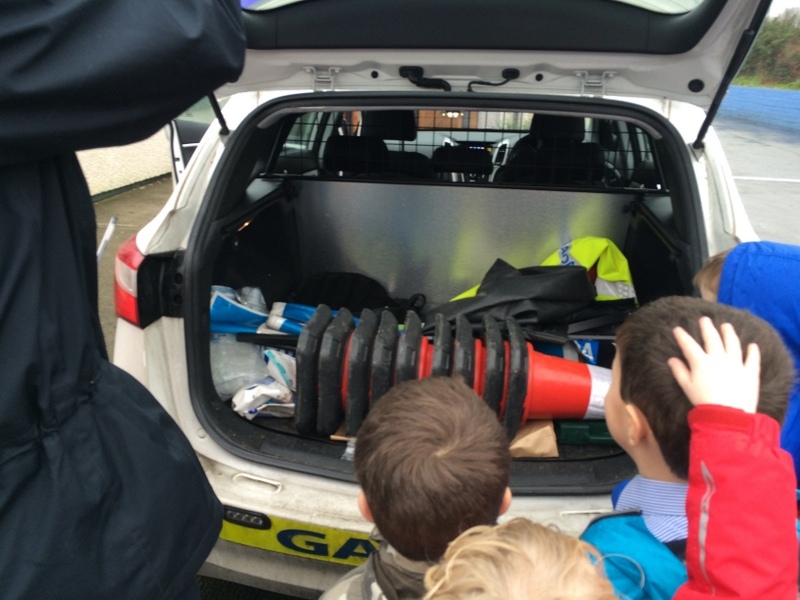 Now we know what the Gardaí keep in the boot! 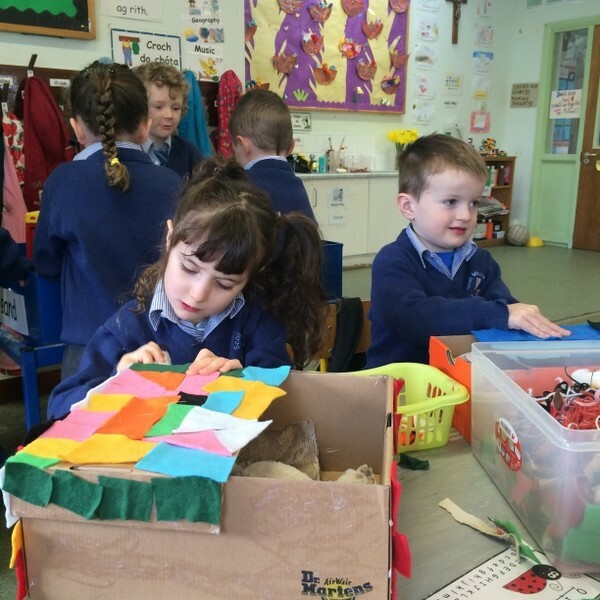 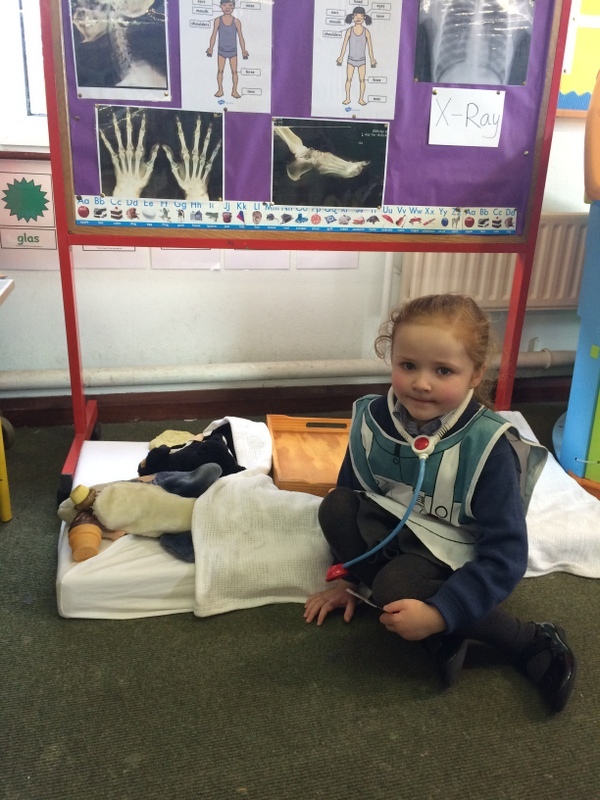 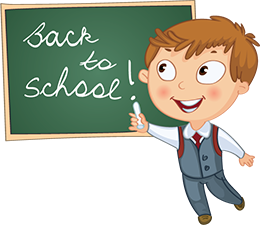 In recent weeks, we discussed the important service provided by the hospital and set up our own hospital in the classroom. 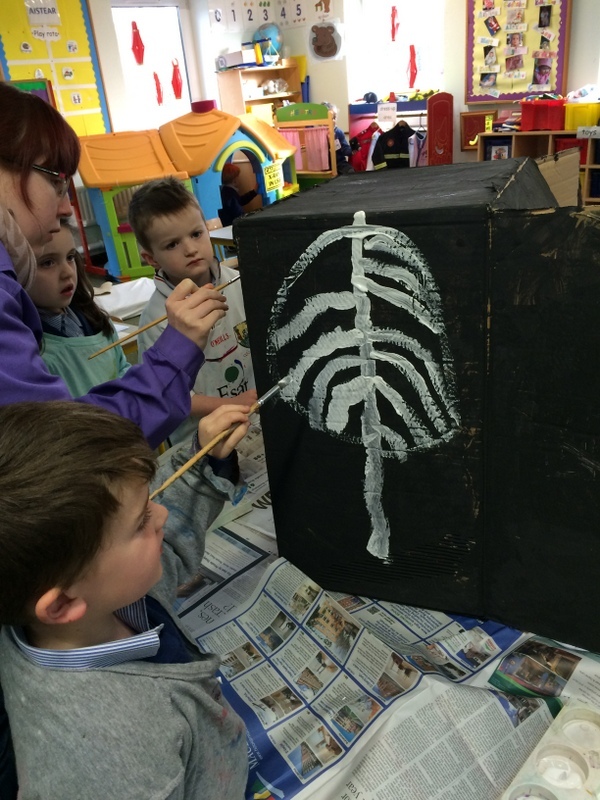 We even created our own x-ray machine for the x-ray department. 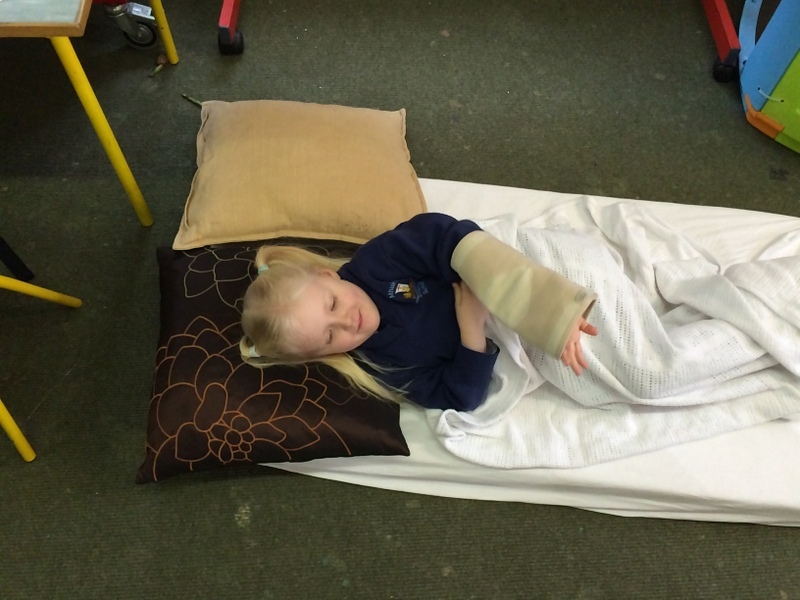 Finally we made beds for sick dolls and teddies to use in a dolls’ hospital. 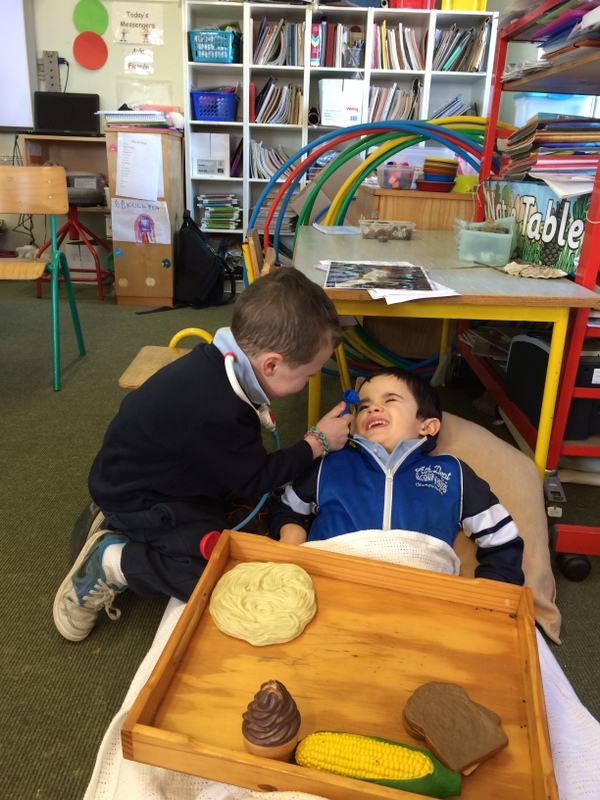 The stetescope is used to listen to a patient’s chest. 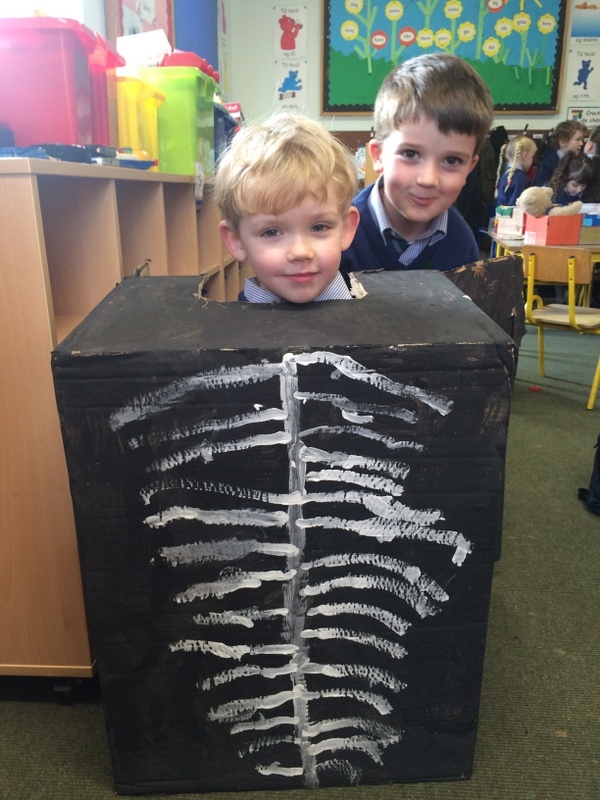 We had to examine the xrays carefully! 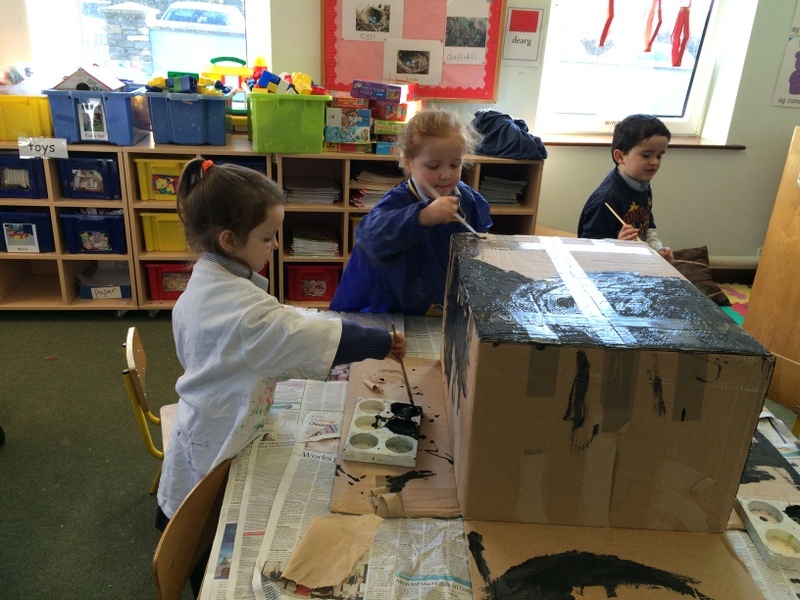 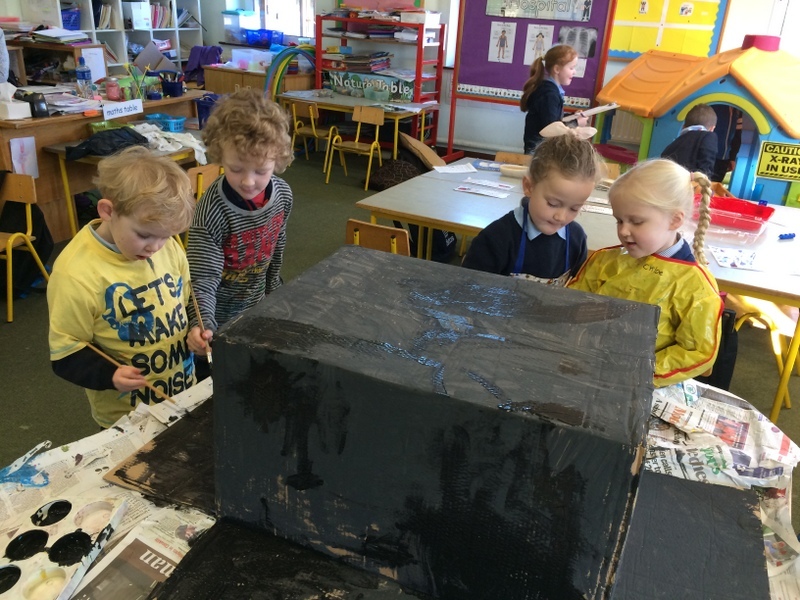 We used a lot of black paint! 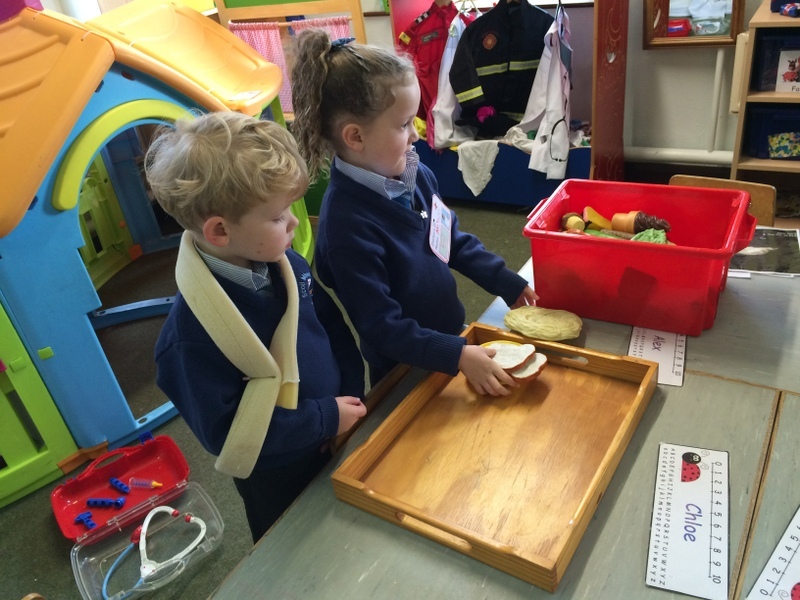 Preparing food for the patients. 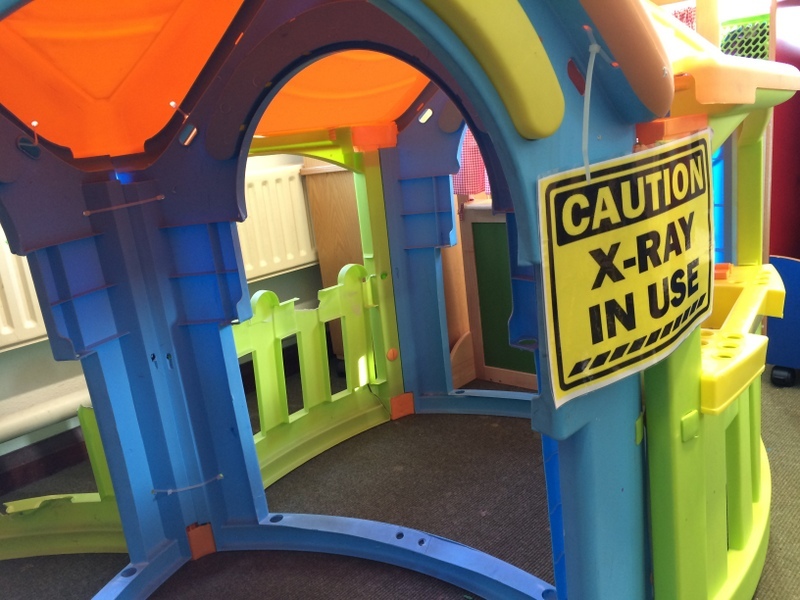 The xray machine turned out great! 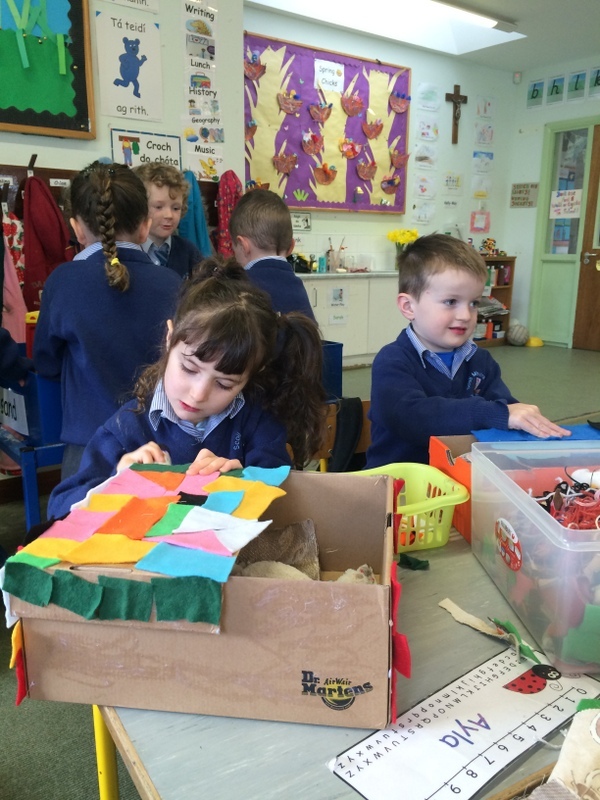 Making beds for the dolls’ hospital! 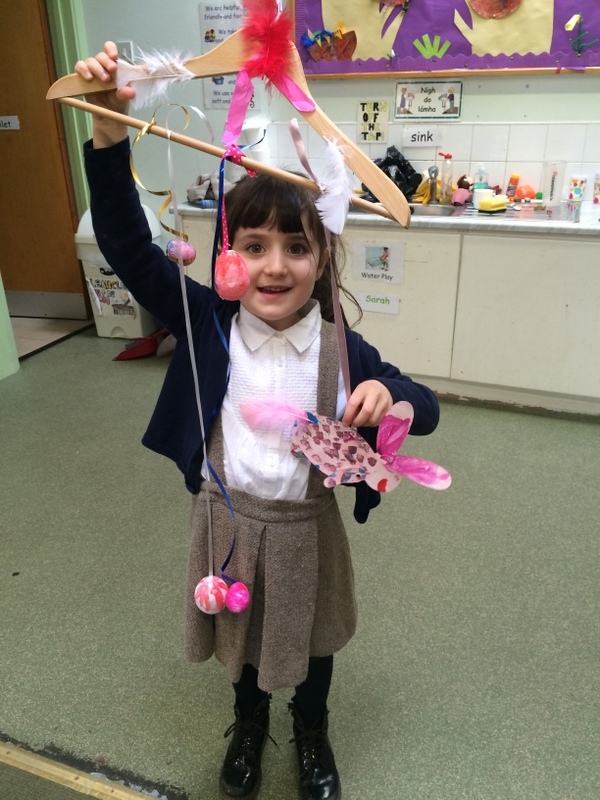 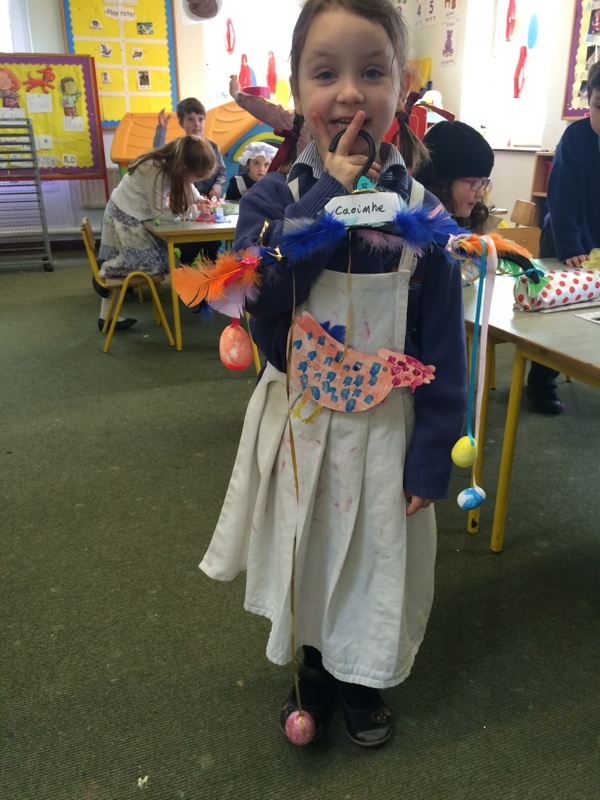 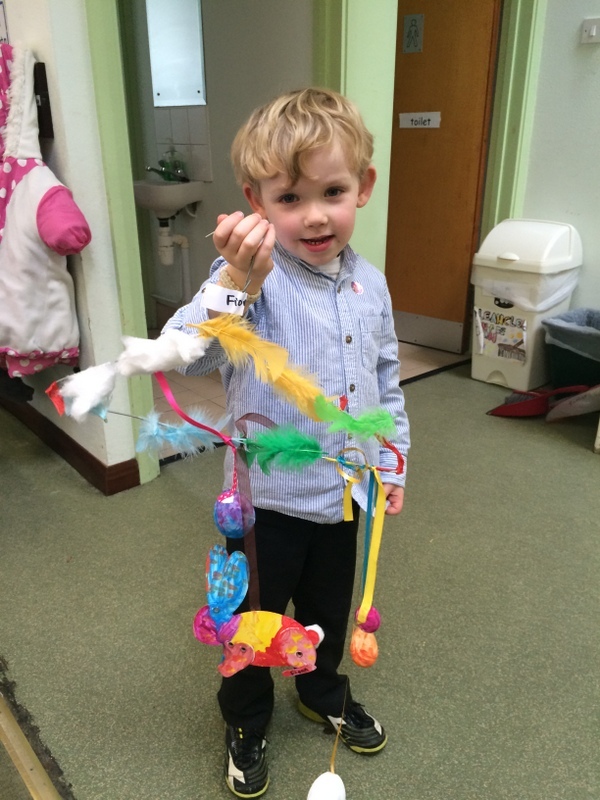 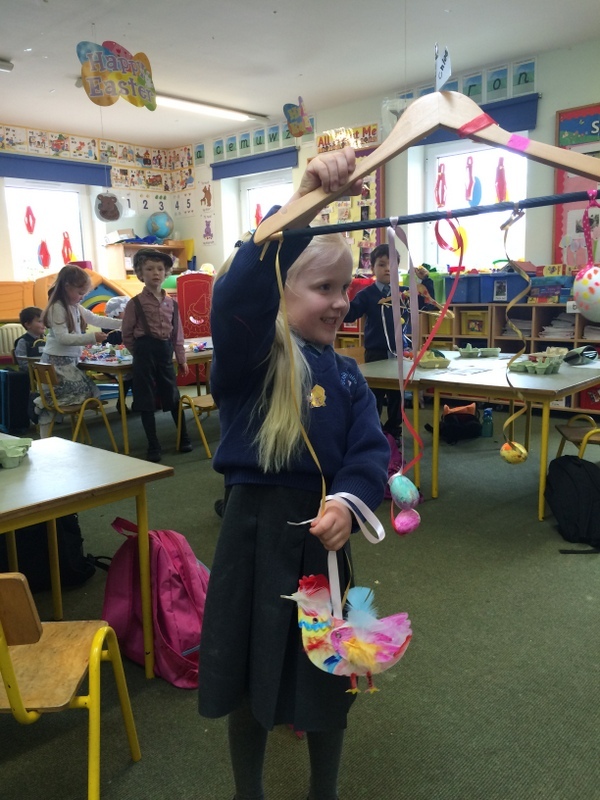 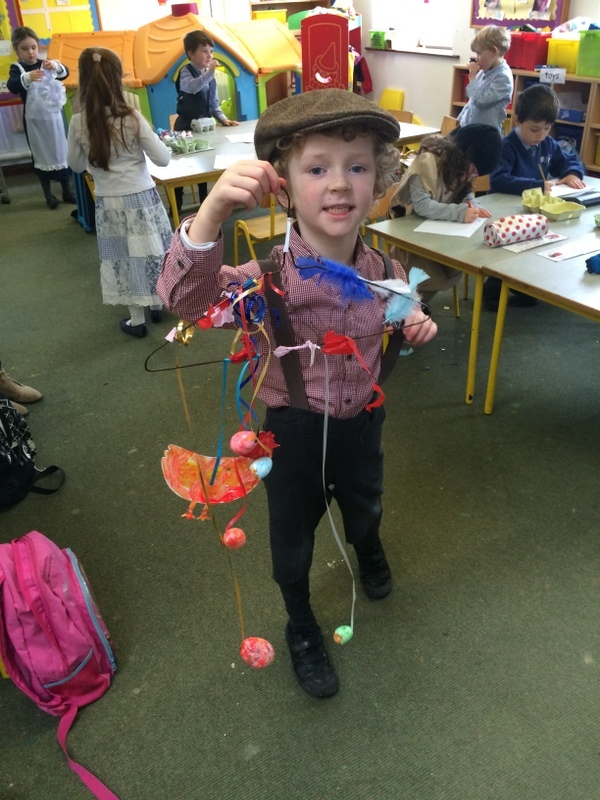 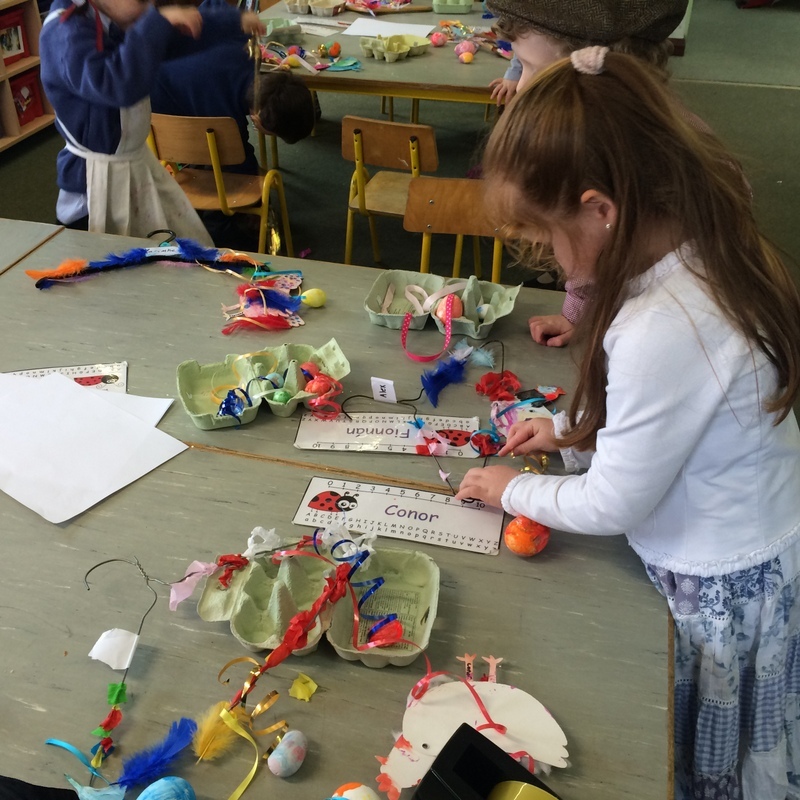 In the lead up to Easter, we have been exceptionally busy making Easter eggs and mobiles! 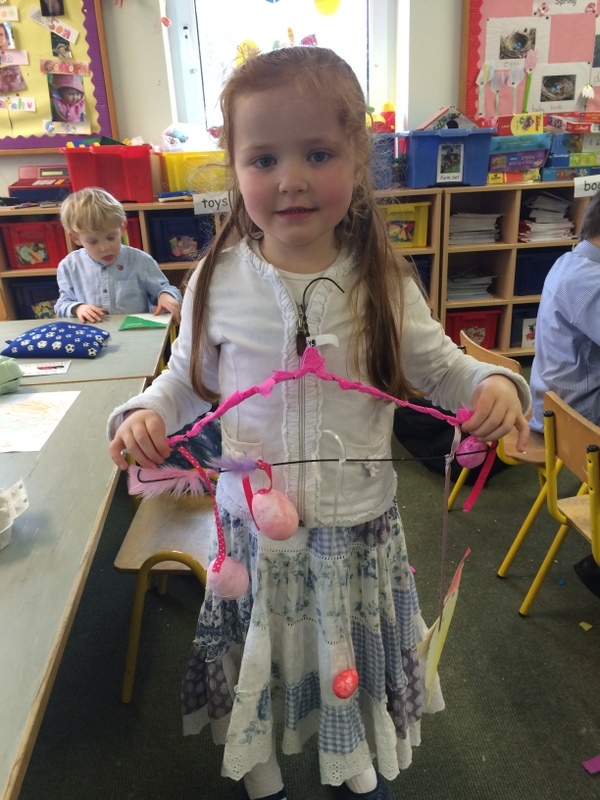 We made Easter decorations for the classroom by decorating card Easter eggs with fabric and fibre and glitter. 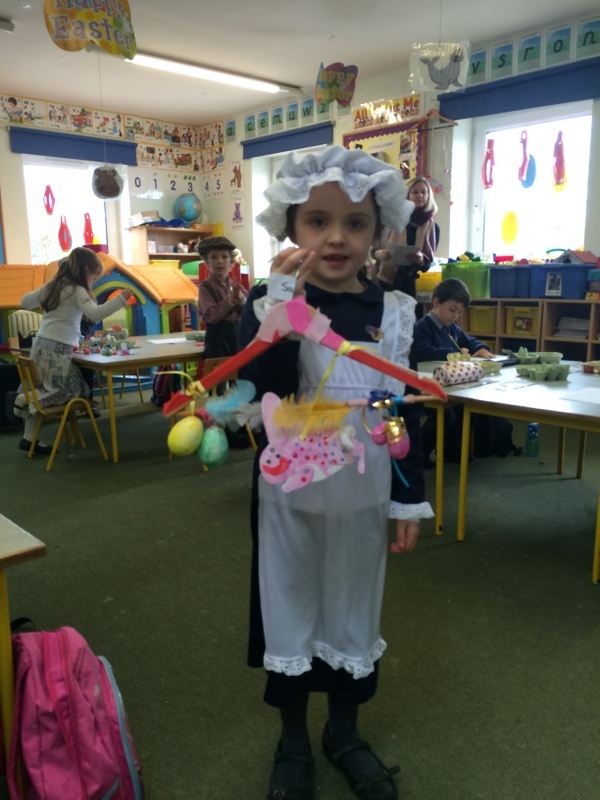 They looked great. 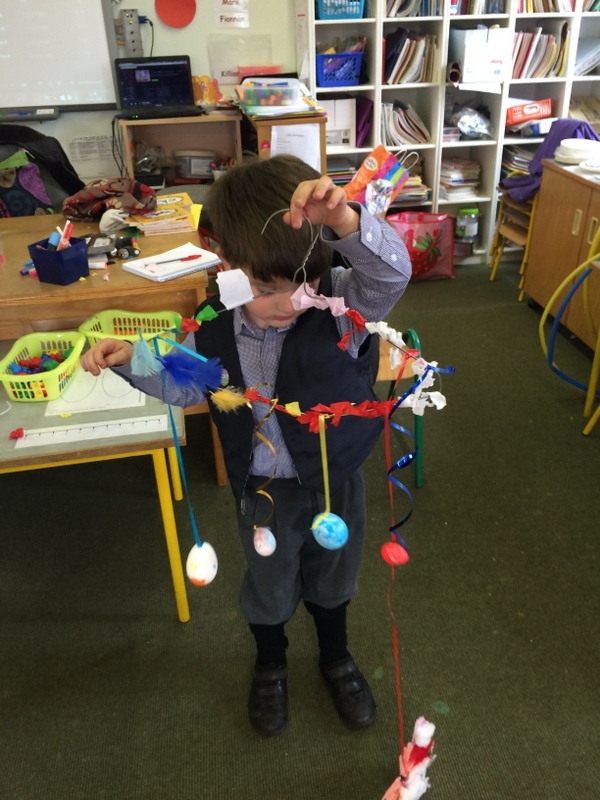 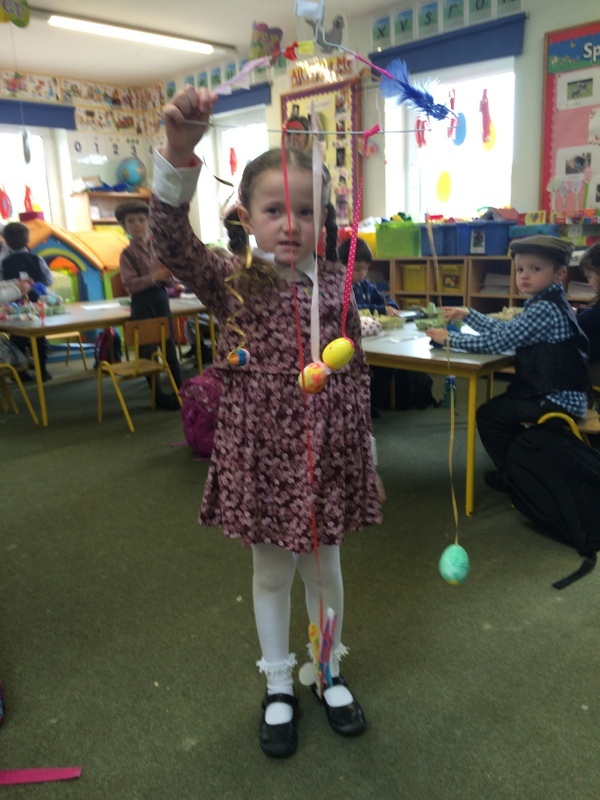 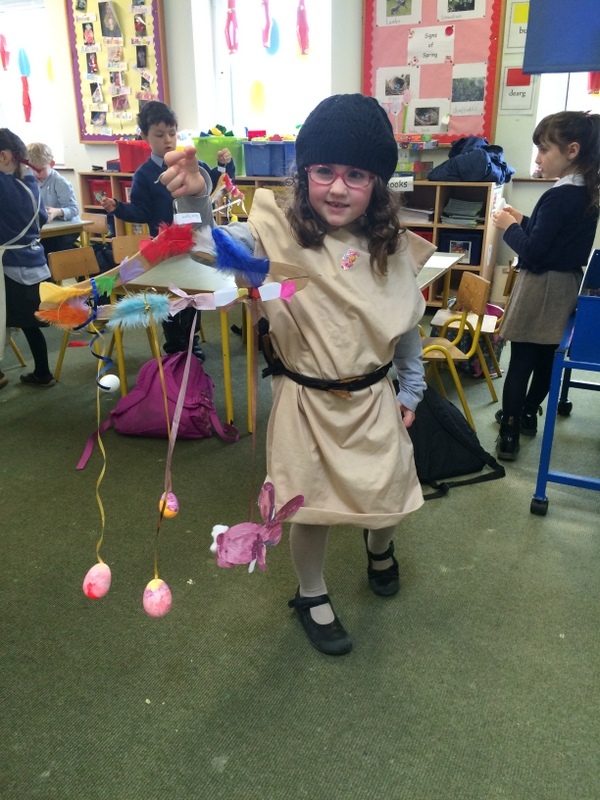 We also put a lot of work into making Easter mobiles. 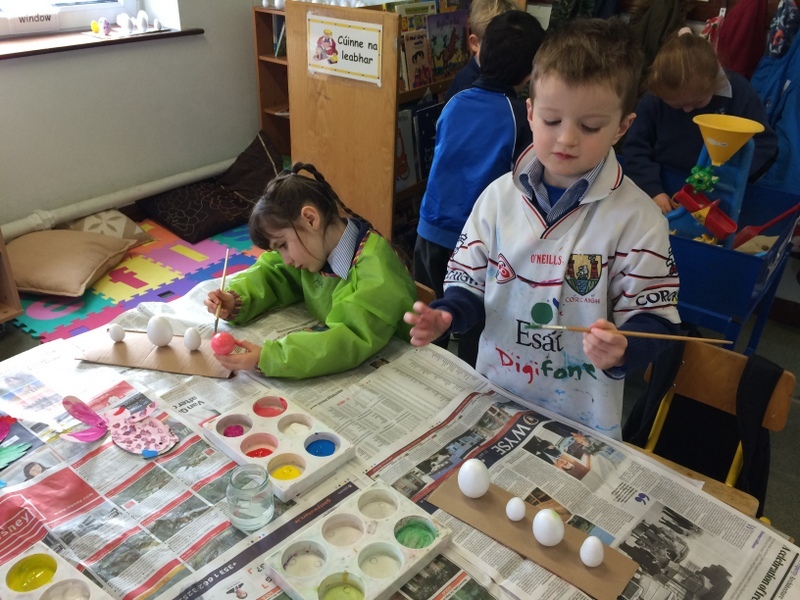 First we had to put an undercoat on the eggs and then return to them later to add patterns to them. 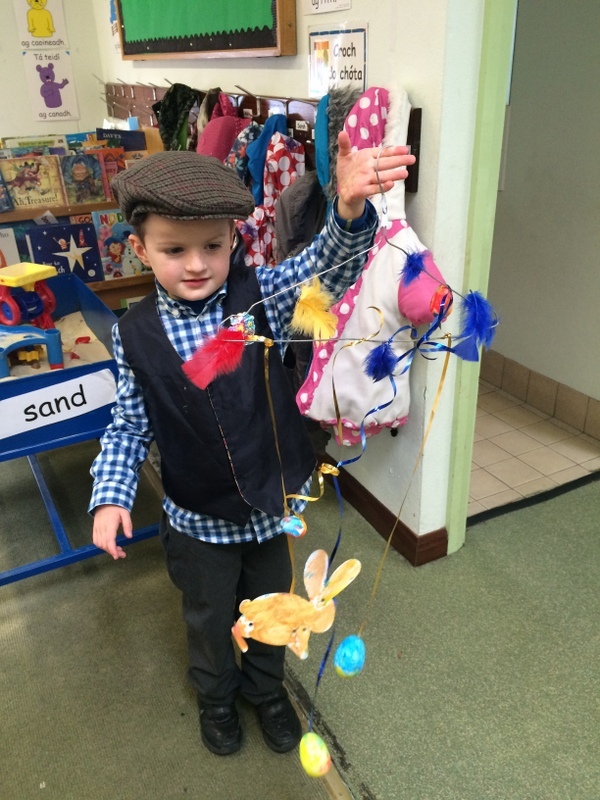 We also painted hens and bunnies and decorated coat hangers. 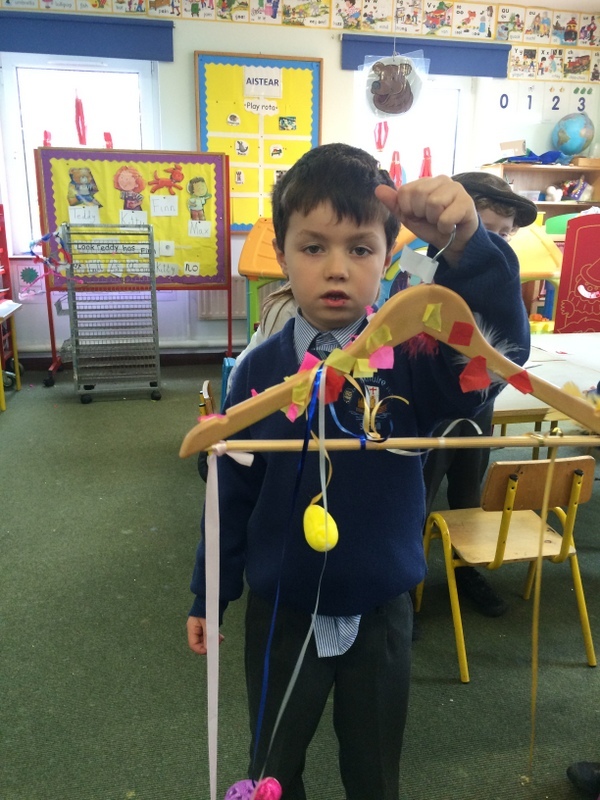 Finally we used glue and ribbons to assemble our mobiles. 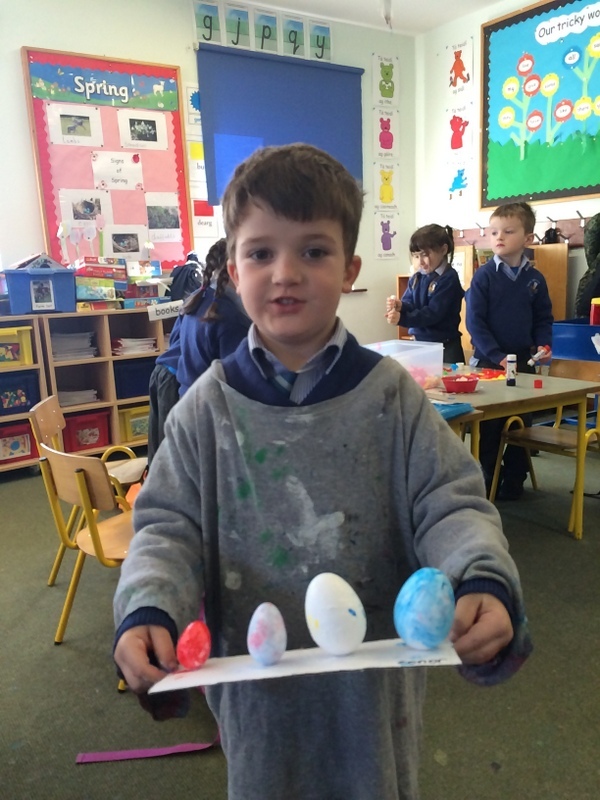 They turned out fantastic and we are very proud of them. 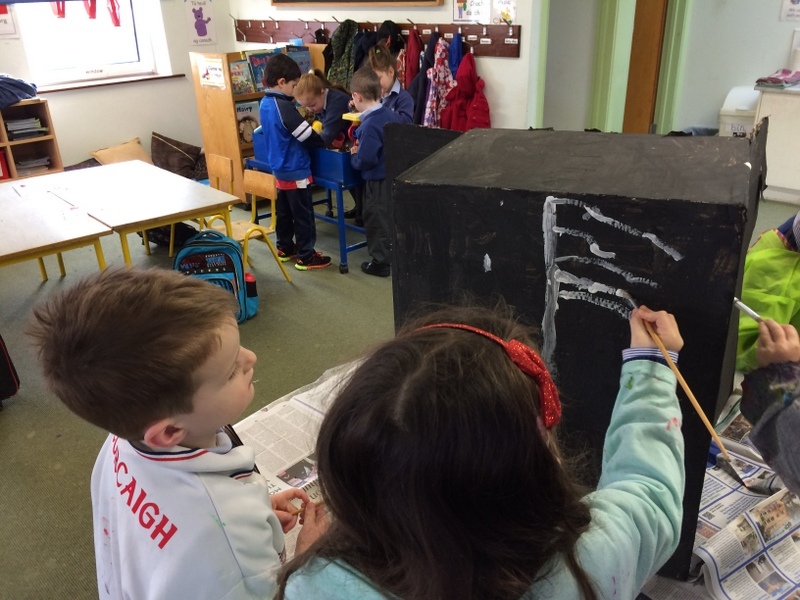 Cáisc Shona Daoibh go léir.